HAGGART, JOHN GRAHAM, mill owner, politician, and militia officer; b. 14 Nov. 1836 in Perth, Upper Canada, son of John Haggart and Isabella Graham; m. there 26 May 1861 Caroline Douglas, and they had two children; d. 13 March 1913 in Ottawa and was buried in Perth. John Haggart Sr arrived in the Canadas in the 1820s from Breadalbane, Scotland, and was engaged as a stonemason on the Welland Canal and as a contractor on the Rideau Canal. He married a native of the Isle of Skye, Scotland, in 1836. In partnership with George Buchanan in 1832, he had acquired a lease to operate Alexander Thom*’s grist mill in Perth, on what came to be known as Haggart’s Island in the Tay River. By 1840 he had erected there a cluster of carding, flour, and sawmills and a finely crafted stone house of Regency design. 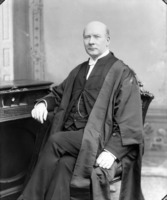 Educated in the public and grammar schools of Perth, John Graham Haggart was studying law under John Deacon when, after his father’s death in 1855, he took over the family business. For the rest of his life Haggart would be involved in milling. Through various partnerships, he developed the Perth Mills; in 1870–71 the flour mill was rebuilt and in 1886 he converted it to roller-mill technology. 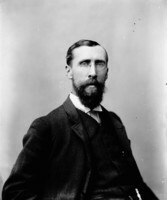 By 1896 he had become as well president of the Tay Electric Light Company Limited. Haggart’s true calling, however, was politics. 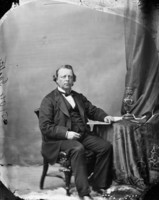 He sat on the town council, was mayor of Perth in 1861–62, 1863–64, and 1871–72, and tried twice, unsuccessfully, to win election to the Ontario legislature for Lanark South. 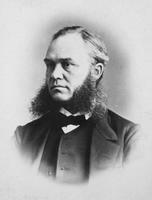 He withdrew as a coalition candidate before final balloting in a by-election in 1869. Despite his claims to be a Conservative, he ran as a Liberal two years later but he finished second. Haggart won local distinction in Perth and, later, national ridicule for his role in promoting the construction of the second Tay Canal. 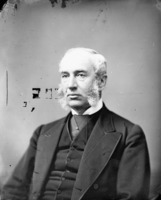 In 1880–82, with the aid of Francis Alexander Hall, mayor of Perth, and Manotick businessman Moss Kent Dickinson*, who sought a better water supply for the Rideau Canal system, Haggart pressed a sceptical Department of Railways and Canals for a new branch canal. It would consist of a cut from Beveridge Bay on Lower Rideau Lake to the Tay River above Port Elmsley and a deepening of that part of the route originally created by the private Tay Navigation Company in 1831–34 between the Rideau Canal and Perth. The new public venture fed on the excitement over proposed mining developments in phosphate, mica, and iron ore. The canal was erected in three stages between 1882 and 1891. The final stage exposed Haggart’s self-interested manipulation of funds in creating a waterway, sarcastically named Haggart’s Ditch, that would be over budget and under utilized. 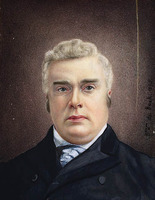 Construction was halted after he was found using unexpended funds from a previous contract to extend the canal to his flour mill in Perth just before the general election of 1891. 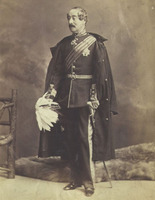 As minister of railways and canals, Haggart was none the less valued by Thompson. 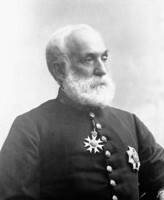 He was credited with improving the financial status of the Intercolonial Railway and with overseeing the completion of the Sault Ste Marie Canal, the last link in the chain of Canadian canals connecting the Great Lakes with the St Lawrence. 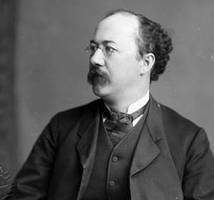 Following the Conservatives’ defeat in 1896, he became a vigorous critic of Liberal railway policy. Portraits of John Haggart Sr and John Graham Haggart by an anonymous artist are hanging at the Archibald M. Campbell Memorial Museum (Perth, Ont. ), and photographs of the subject are available in NA, Documentary Art and Photography Div., PA-25679 and PA-26382. AO, RG 22-168, no.2786. Elmwood Cemetery (Ottawa), Tombstone inscriptions. NA, RG 31, C1, 1871, Perth, div.2: 31; div.3: 11; schedule 6: 5. Old Burying Ground (Perth), Haggart family plot. Perth Courier, 22 Jan., 5 Feb. 1869; 24, 31 March 1871; 14, 21 March 1913. Perth Expositor, 7 May 1885, 22 Oct. 1891, 14 May 1896. Canadian directory of parl. (Johnson). Canadian men and women of the time (Morgan; 1898 and 1912). Ont., Chief election officer, Hist. of electoral districts (1969), 187; Ministry of Culture and Recreation, Heritage administration branch, Historical sketches of Ontario ([Toronto]), 1976: 12–13. Larry Turner, The second Tay Canal in the Rideau corridor, 1880–1940 (Parks Canada, National hist. parks and sites branch, Microfiche report ser., no.295, Ottawa, 1986). Larry Turner with J. J. Stewart, Perth: tradition & style in eastern Ontario (Toronto, 1992). Waite, Man from Halifax. Larry Turner, “HAGGART, JOHN GRAHAM,” in Dictionary of Canadian Biography, vol. 14, University of Toronto/Université Laval, 2003–, accessed April 19, 2019, http://www.biographi.ca/en/bio/haggart_john_graham_14E.html.